“Ada, may I have money for candy from the gypsies?” asked Arwen sweetly as she peered up over the top of her father’s desk. 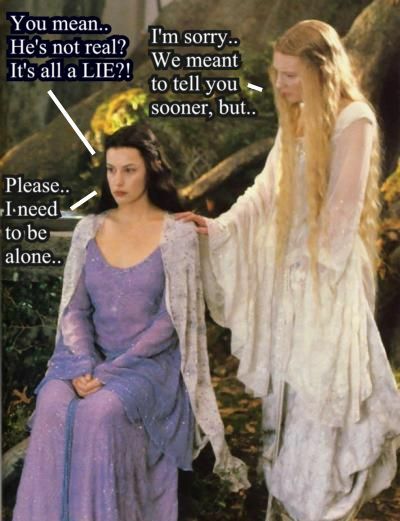 “Sweetheart, we call them ‘wanderers’, not gypsies, and no, you may not,” Elrond answered. “Oops,” replied Elladan, still grinning. The Lord of Imladris’ mind wandered back to a time some hundred years before, when he was being asked the same question that his daughter asked, but by his two sons. “Well, we know we do not neeeeeeed it, but we waaaaaaant it,” whined Elrohir. 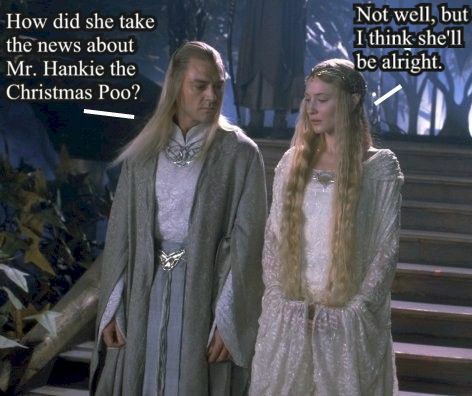 Elrond’s thoughts flashed forward a few hours after that conversation. He had finished his work early and decided to take a walk with his wife in the courtyard. During the winter when Gildor’s company was in the valley, they would set up their tents and camp in the valley, with a few wagons open for business so that the residents of the Homely House could purchase trinkets and such, including various candies. Under a tree, a makeshift little stand was occupied by a pair of elflings and some of the saddest wares ever made available to the Elves of Imladris. “Stuff for sale! Buy it now!” shouted Elladan to anyone and everyone passing by. 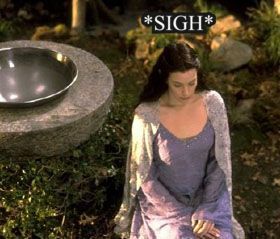 “Oh, my goodness,” giggled Celebrian, while Elrond glared and marched over to the booth. “Just what do the two of you think you are doing?” he demanded. “Sure!” shouted twin happy voices, rushing about to do as they were told. “Oh, darling, they are just children. Candy?” she asked, pulling from some concealed place a much larger bag of candy, which was opened to reveal some of Elrond’s favorite treats. After Arwen left, Elladan leaned down on the desk and looked his father in the eye. “What about me?” he pouted. With a snort, Elladan stood up and shook his head. “I had to try,” he said as he began to leave. Elladan turned around, catching the coin that was tossed to him. “Share that with your brother,” added Elrond before returning to his work.